Many community college students want to earn a bachelor’s degree but end up wasting time and money taking classes that don’t count toward their four-year degree. OSU-Tulsa’s Transfer Maps eliminate that obstacle. Transfer Maps help you take the right courses for the right degree program to reach your professional goals. What that means: If you follow the course plan outlined on the Transfer Map and verified by your OSU-Tulsa academic counselor, your credits will transfer toward the specified OSU degree, in Tulsa or Stillwater. Map your way to your career with information on graduate programs, employers and salaries – so you know where you’re going before you take a single course. Your map. Your degree. Your career. Don't see your desired degree program on this list? Make an appointment with an OSU-Tulsa academic counselor, and they can help you create a transfer plan that fits your professional goals. A major map that contains program information, course examples, requirements, costs, timeline, graduate program options, and career and salary information. 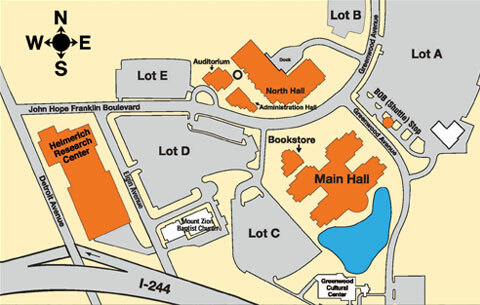 A course map that shows the classes that transfer into your desired OSU program.